Just as I was wondering how long the tissues of a dead finger remain viable to unlock a Smart Phone in some forensic mystery, I found myself entering a dark wood in the middle of someone else’s life, in a taxi speeding us through dimly lit side streets in Florence, racing non-stop through that maze-with-narrow-turns, and the tassista, cab driver, also non-stop on his cellphone; and the word: barbari, meaning barbarians, meaning us, we strangers, came to mind when I saw the cabbie glancing into the rear-view mirror once, looking fierce, unshaven, as if each of our names were Attila and he would soon join other Florentines with the Visigoths against the Huns, and have a finger from each of us, if not whole hands. IN A MOMENT WE MAY BE STRANGELY BLENDED, Poems and Prosepoems. David Giannini’s Faces Somewhere Wild spans his 45 years in the Berkshire hill-towns of Massachusetts. 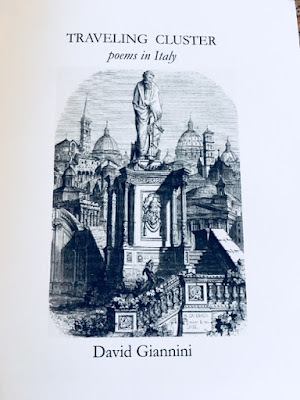 … Giannini is the poet-hunter, who identifies himself as prey, in search of what waits at the threshold of expression: It wants to grab you by the throat. You don’t turn away; /instead, you unbutton your shirt. Category: Dos Madres Press. 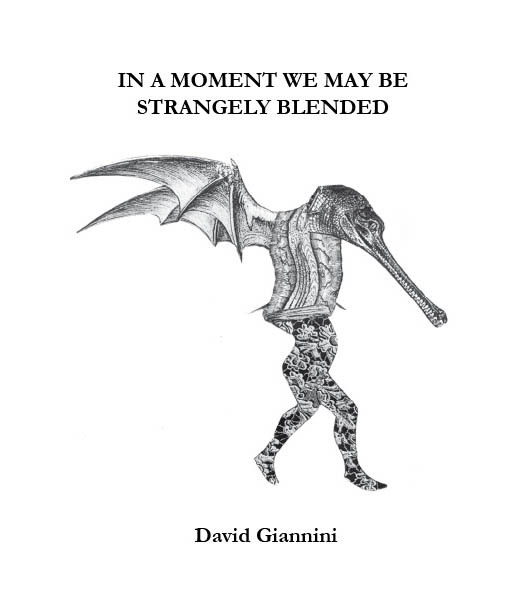 Other Books by: David Giannini. shifting in a loose yellow dress. be the gift your shadow brings. 13 “shape” poems published in September, 2016. Click sidebar for Feral /Prehensile Pencil Press. 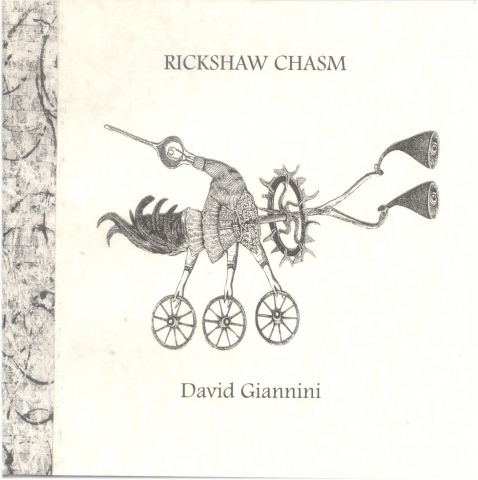 David Giannini’s most recently published collections of poetry include AZ TWO (Adastra Press), a “Featured Book” in the 2009 Massachusetts Poetry Festival; RIM/WAVE (Quale Press) in 2012;, and 10 chapbooks in 2013-15 including INVERSE MIRROR, a collaboration with artist, Judith Koppel;. His work appears in national and international literary magazines and anthologies. Awards include: Massachusetts Artists Fellowship Awards; The Osa and Lee Mays Award For Poetry; an award for prose poetry from the University of Florida; and a 2009 Finalist Award from the Naugatuck Review. 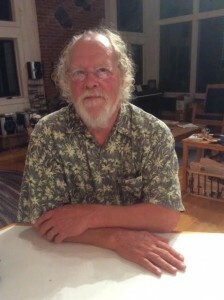 He has been a gravedigger; beekeeper; taught at Williams College, The University of Massachusetts, and Berkshire Community College, as well as preschoolers and high school students, among others. Giannini was the Lead Rehabilitation Counselor for Compass Center, which he co-founded as the first rehabilitation clubhouse for severely and chronically mentally ill adults in the northwest corner of Connecticut. 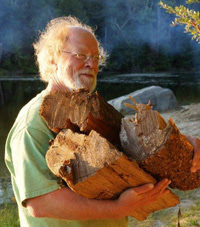 He lives among trees in Becket, Massachusetts with his wife, Pam. On OTHER’ LINES …I don’t see how any close reader won’t come away learning a great deal about the potential in quotation, the distinctness of first lines & the possibilities of form. That’s a lot for a project of this scope to accomplish. Yes, it’s very deftly done, and there is much that is both attractive and amusing: Paul Pines, Charles Olson, and Howard Nemerov as bedfellows is a bit difficult to imagine, but your result is convincing. What comes through to me is the likenesses between all human beings, no matter how differently they may perceive things. It certainly must have been a colossal undertaking. I think you have really triumphed. 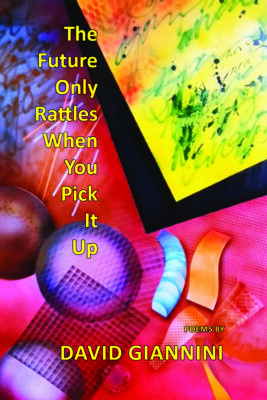 These are poems that succeed most of the time as poetry and carry a real spiritual impact. And your way of using the whole page, if necessary, to get the space/time equivalents you need may transform all of our writing. Many of these poems, though short, resonate deeply, and few poets get so much from so few words. These two books complement each other through Giannini’s great skill with language and his ability to join the concrete and the abstract. It’s poetry grounded in the earth. —Mark Farrington, Assistant Director and Fiction Advisor in the Johns Hopkins M.A. in Writing Program in Baltimore and Washington, D.C.
A girl once “dressed feathery” in seventh grade, for church, and perched pretty, big eyes above a pew. There was some trouble in her. She prayed light was once a first feather and darkness the body of unknown bird. She wanted to escape, through tears to flee, yet not to be seized by talons. Because there was some trouble in her, she wept for herself. The Chippewa say we forget when we pity ourselves that all the while we are being carried on great wings across the sky. Today, I saw a Barred owl stressing a branch—left without a sound. That beauty sometimes takes off from resistance. There was no trouble in her. Light, the first feather. Darkness, the body of an unknown bird. This is the light that makes drivers imprecise and cats more arbitrary. This time of day is the world’s downcasting flight, when the black tribe people of the dance-and-daylong-smile feel death, grow down into themselves as plants that have no other way to reach, and the crow folds his sorrow in the neighboring limbs. I move indoors, can’t locate what’s gone from me. It must be some light has left. My body feels dark as its locked-in blood. It knows an unspeaking place, yet one sentence it must bear into the world: What moves—moves through. I rise to switches, turn up dry ponds of light. Your presence is everywhere, sustaining what they cannot open. Everything not in them has your hair. I have stacked cairns of wood since we moved here, a way of honoring the roundness of trees with their own logs, plus there is a sense of the age-old power of a circle, in this case brought high, as any good Druid would do, a difference being that these cairns, unlike their ancestors in stone, ‘live’ only a season. The cairns also save space since more cordwood can be ‘stored’ round and upright within a smaller area. The man who delivers our stovewood knows what I mean when I order cairns to be brought. A cairn is a cord rethought. In the bright afternoon I stacked split wood into the shape of a giant skeleton key placed on the open floor of pine needles. After finishing that chore I saw a sunbeam crossing cherry beech and ash lift and turn the stack until a door opened in air, and on the other side a lithe presence, having waited long months in the cold and having felt everything empty itself and be cut off and divided, dipped itself in light’s applause of it being green and of insistent being. So little in the woods so far: moss & grasses all. Poetry making purpose stand up taller. The ragged right hand of the work glove left out on the woodpile begins to pulsate at the wrist as if a chipmunk’s entered where none and no one is. How to explain this pulse of an emptiness in the sun, the fingers as yet unmoving and the work undone? No one knows the whole life of things, of wood once living or this glove in the shape of a hand. Memory is both organic and inanimate and can show itself banged up and tattered by what first motioned it into shape. So it is that part of whatever you are is sometimes left out, outside. The wrist is history. on the way to the next word…in the face of the next (and the next) poem to occur, be written, sung, or said. So guess what? No one’s going to prepare your way. No way to do that. You and I have to be unprepared in the face of the next poetry finding paths in us. Or nothing will occur. To take a bath along the way—Gunter Grass said he had need after writing prose to bathe in poetry because he felt dirty next to words singing and seeing what his own could not. Or take a shower. Feel rain. A spring-fed pond. Brook or lake or sea. Any—or all. Then walk an open ground—breathe. We draw our waters from our sense of place and from ourselves and others—from you and I as we utter human kind from blood and play, from saying and singing, from bone and our human heart, all from the inexorable one, Being—being that. Even Late Pleistocene human population bottlenecks needed relief . Although most individuals leapt forward, there is evidence that occasionally one jumped from the cliff edge while facing backwards and thus may have watched the rush of rockface while falling for a new twist of view in that early world. Ah, the furred avant-garde. Today, among these remains at the base of the cliff, we set the bones of his neck on the ground next to the ossified gossip of jaws, the aegis of ribs, no shadow to the slender arms, just bone jolly absorption tease, skull gone to charred granite from the fire pit. He might have been a first artist listening to the forebears of those wings in the cave behind you and learning to tune the wind with his hair. His heart vanished on that stone in your hand.